Sit comfortably for hours while quilting, sewing, reading, driving, and more. Softly inflated flexible disc prevents fatigue and reduces pressure on the tailbone. Helps relieve lower back pain, strengthens core muscles, and improves posture. Nubby texture allows cooling air flow, and promotes improved blood circulation. 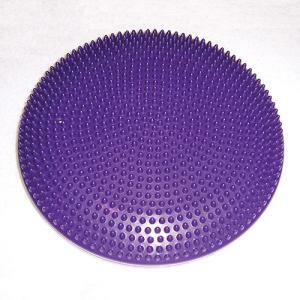 Durable purple rubberized material remains soft and pliable. One size fits all!